Heavy Duty Professional Log Splitters and Automatic Saws. As Alsatians AMR like toughness and quality, promises to be kept and for commitments to be met. The machines we offer are the same: sturdy, reliable, and designed to last for a long time. AMR are well represented in central Europe, first geographically, but also because AMR machines are sold from Norway to Spain, and from Ireland to Romania. Over the years, the log splitters program, that are fully manufactured in AMR's factory of 9200 m2 in France, has been completed by additional machines, needed in the processing firewood cycle: forestry winches, circular saws, band saws, buckets, radio control, log tongs, bundles, etc. ... equipment for which AMR are the exclusive importer in France. 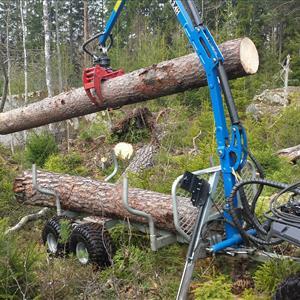 That’s how AMR became one of the largest distributors of forestry equipment and shaping firewood. The AMR team works every day, whether to design machines that AMR will put on the market in the future, whether to produce best quality and reliability equipment, or to support the dealer's actions, with ever renewed satisfaction of knowing that at the end of the chain, somewhere in the forest, there is a person who works with one of AMR's machines, sturdy, reliable, that keeps its promises and respects its commitments.